Look at these mice scurrying across the plate. I think I might start a whole new category in the recipe index: something like Possibly Too Cute to Eat. Scott suggests they should be filed under Possibly Too Creepy to Eat. I love looking at these little mice, but actually I love eating them even more. 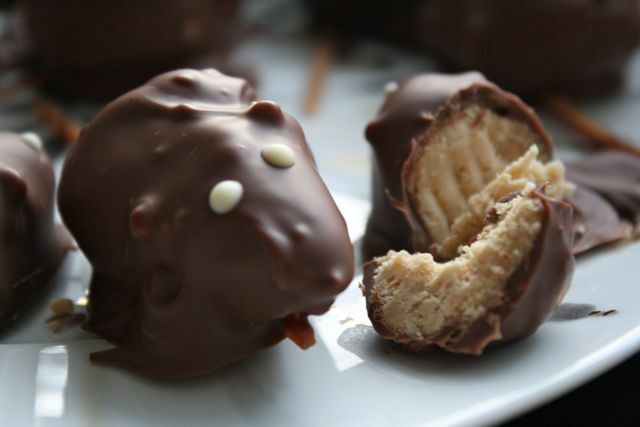 Under their milk chocolate fur, their innards are crispy peanut butter. These are sort of like the animal version of a peanut butter cup – but a lot better because these mice were born with real peanut butter and lovely, melty milk chocolate. I made these mice for book club last week. We had just read The Night Circus by Erin Morgenstern and we all brought circus-themed treats. I was intrigued when I read about the chocolate mice with licorice tails. The mice are a bit involved because you have to chill the innards before you can dip them in a thick coat of milk chocolate. But they're also pretty simple: mix the peanut butter with a bit of melted butter, icing sugar and crispy rice cereal and you can shape your little mouse bodies. 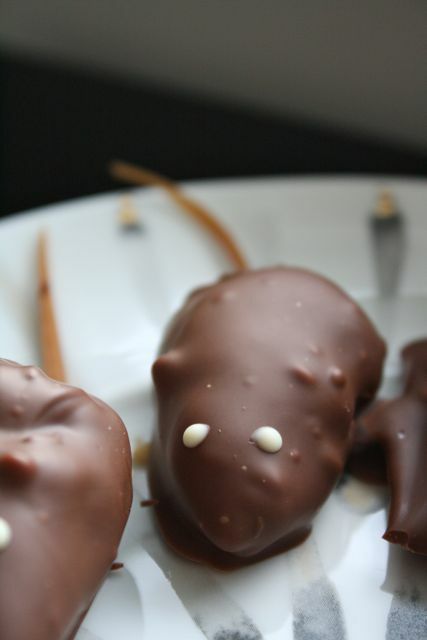 Then you lay out tails on the pan, dip your chilled mice in melted milk chocolate and attach them to the tails . . . Chill a bit and dab on white chocolate eyes. Done. And cute to boot. Mix the peanut butter, icing sugar, 2 tablespoons melted butter and vanilla extract together. If it feels too dry and crumbly, add the other 2 tsp. of melted butter. However, you do want a somewhat crumbly "dough" to shape – but you need to be able to work with it. Stir in the crispy rice cereal. Shape the mice so that they have a somewhat pointy nose and rounded bum. Set them on the prepared pan. Poke "ears" in with sunflower seeds or sliced almonds. Chill in the fridge for about 2 hours. Place the licorice tails on the prepared pan where each mouse will go. 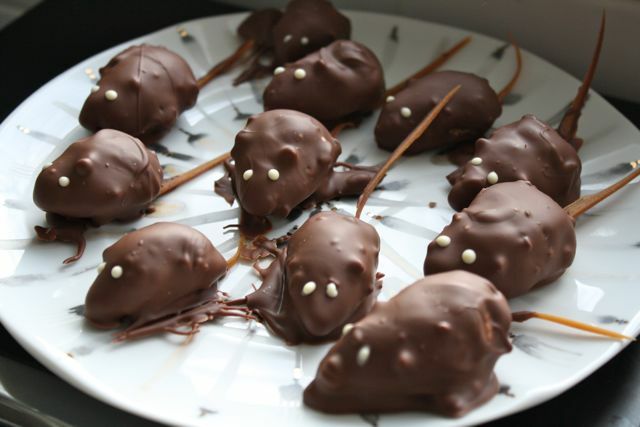 Using two small spoons as tongs, dip each mouse in the chocolate and place each on a tail. Chill for 1 hour until the chocolate has set. Melt the white chocolate and use a toothpick to dab on the eyes. Let set in the fridge. Eat! **Licorice has wheat flour, so these are not gluten free if they have tails. But you can always genetically alter them to be tail-less and gluten-free. Hmmm, maybe it's because I can't eat chocolate that I tend towards Scott's conclusion that it's just a bit too creepy to eat, or even look at! I'm just a bit freaked out about mice! I am 100% siding with Scott on this one. The fur and the innards?! genetically alter!? gah!! Maybe I will make chocolate snowmen with licorice arms. Well, Jessica, you *could* make chocolate snowmen with licorice arms, but I'm afraid they wouldn't be as cute as these mice. I bet they're yummy. Maybe see how some animals go down this year . . . I bet your son would like them! Finally -- someone understands. Thank you. Looks delicious. Very unique. Thanks for the idea. The Night Circus is a magical, dazzling book filled with such heartbreaking and bittersweet angst that almost bought me to tears. If there is one book you read this year, you must read The Night Circus. I want to have babies with this book and cradle it in my arms.By the way, that was such a nice recipe to try.